Fall is an exciting time for many college students. Making new friends and settling into a new environment can be fun, but it also comes with new responsibilities. Whether it’s your first year in college or you are a returning student, adjusting to new classes, studying, trying to fit in social activities, and figuring out your finances can be overwhelming. Knowing your budget puts you in charge of your money. This is essential to successfully managing your finances. A budget helps you track your income and expenses and allot specific amounts of money for spending. Take action now to avoid financial hardship in the future. Start by recording all of your income, such as wages, stipends, and money from parents, and consider any anticipated changes to your income or expenses over the course of the school year. Next, make a list of expenses, such as utilities, rent, school supplies, personal items, food, and entertainment. Include as much detail as possible in your budget to make it easier to track your money. Try using an online personal finance management tool or downloading a mobile app that will create a budget for you to make it easier to stick to your budget. Regardless of the method you choose, consistency is the key to successful financial planning – be sure to spend time on your budget on a regular basis. For more information on working with a budget, visit the Department of Education’s website. Choosing where you bank is an important decision because financial institutions vary by the number of branches and ATMs accessible in your area, the fees charged for services, and products offered. Check out different types of institutions, including national banks, community banks, credit unions, and your college credit union (if available). 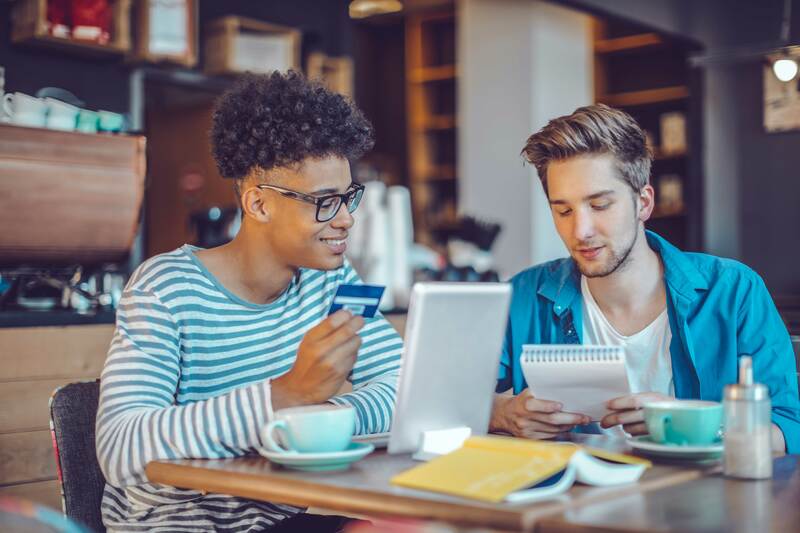 A college credit union may be a good option, as they generally offer the convenience of on-campus branches and ATMs, as well as, credit cards and loans geared toward students. Also, think about the features that are most important to you, such as free student checking and savings accounts, reimbursement of fees if you use an out-of-network ATM, online bill pay, and the ability to transfer funds from one institution to another. Be sure to read all of the disclosures provided when you open an account to ensure that what you’re getting is accurate and consistent with the terms and fees disclosed. Also remember to incorporate account-related fees into your monthly budget. If you are opening a new checking account, you will likely have access to a debit card to make payments and purchases, online bill pay services, and apps that allow you to send money to another bank account. These options are convenient, but with so many available to use, it’s easy to lose track of your account balance. If you withdraw cash without enough funds to cover the transaction, it is considered an overdraft, and the bank may decline it and charge you fees. Most banks offer overdraft coverage programs, if you opt-in, and will process the transaction even when you don’t have enough money to cover it, but you are still required to pay back the transaction cost along with additional charges for the coverage. To avoid these issues, maintain an accurate record of all of your transactions and keep track of your account balance in your checkbook register, budget app or software-based tool every time you make a deposit, write a check, use the ATM, use your debit card, pay a bill online, or transfer money. Sign up for account alerts, if your bank offers it, which sends automatic text messages or emails to notify you of a low or negative balance. Also, carefully review your monthly account statements, and if you see an error, notify your bank immediately to correct the mistake. As a college student, you will be inundated with credit card offers. For some, this may be the first step in building credit. While building credit is important, understanding how to manage it is equally important, since your credit report will be checked when you apply for a job or to rent an apartment. If you decide to apply for a credit card, look for a card with a reasonable interest rate and no annual fee. Avoid using your card impulsively and charge only what you can pay off the following billing cycle. As long as you pay the card balance in full by the payment due date each month, you won’t be charged any interest or finance fees. The Truth in Lending Act provides consumers with protections when dealing with lenders and imposes requirements on banks when offering credit, including special provisions for borrowers under the age of 21. For more information, visit Consumer Protection Topics – How to Choose and Use a Credit Card. Saving money in college may seem impossible when funds are already scarce, but consider opening a savings or money market deposit account to regularly set aside money and earn some interest. Treat savings like a bill and pay yourself first, even if it’s not much. You will be surprised at how consistently saving a seemingly insignificant amount of money adds up over time. Setting savings goals that are easy and manageable creates a habit of saving that will continue well into the future. Managing your finances while at college does not mean you have to miss out on having fun. Stick to your budget, explore your financial options, look for student deals that include discounts on text books, control your credit card usage, and save as much as you can no matter the amount. Learning and practicing the fundamentals of money management now can set you up for financial success in the future.